iPad Mini 16gb WiFi 1st Generation. Condition is Used. Shipped with USPS Priority Mail. This is a universal mount for all your large tablet needs. Powerful vacuum suction cup base safely and securely mounts your iPad or Tablet to your car windshield, desk, and many other flat surfaces. You don't have any rights on your phone how can you owned your own phone?. After upgrade you will have root, Viper4Android with Sound driver properly installed, Fully deodexed, Debloated ; removed many google, Samsung bloatware (almost 76 to 120 bloatware ). New High Quality Battery For iPad Mini 2 & 3 2nd 3rd Gen A1489 A1490 A1491. Perfectly replace no-effective battery. It includes a battery. Item easy to install, but it also needs professional install skill. IPad Mini 2nd Generation A1489 A1490 A1491. iPad Mini 3rd Generation A1599 A1600. LCD Display for iPad Mini 2. 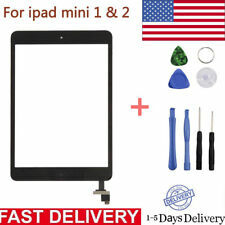 1x LCD Screen for iPad Mini 2. LCD Display and Touch Digitizer Screen Assembly. 1 x IPad Mini 4 LCD Screen Touch Digitizer Assembly (White). Apple Ipad Mini 4. Each Screen is Tested and 100% Working Condition. What You Get. Both the WiFi and Cellular version motherboards will fit. Generation, with the SIM card holder. Have you dropped your first generation iPad Air?. Note that these are used chassis. Each is serialized and the serial number will be noted. This is the iPad Mini 2/3 LCD screen only. It does not include the digitizer touch screen. Modelfor ipad mini 2nd 3rd Gen. You have to disassemble the tablet to change this iPad Mini LCD display. Special tools and skills are required. Samsung Galaxy Tab 3 Lite SM T110 7.0. Touch Screen Digitizer - White. Kindle Keyboard. Kindle 3 Wi-Fi. Kindle Graphite. ◆ 100% OEM Baterry. There may are little Scratches on surface ,it was happen in Transport and storage Progress ,but it will not affect its performance. This is an GENUINE APPLE LCD. for an ipad 2 -.